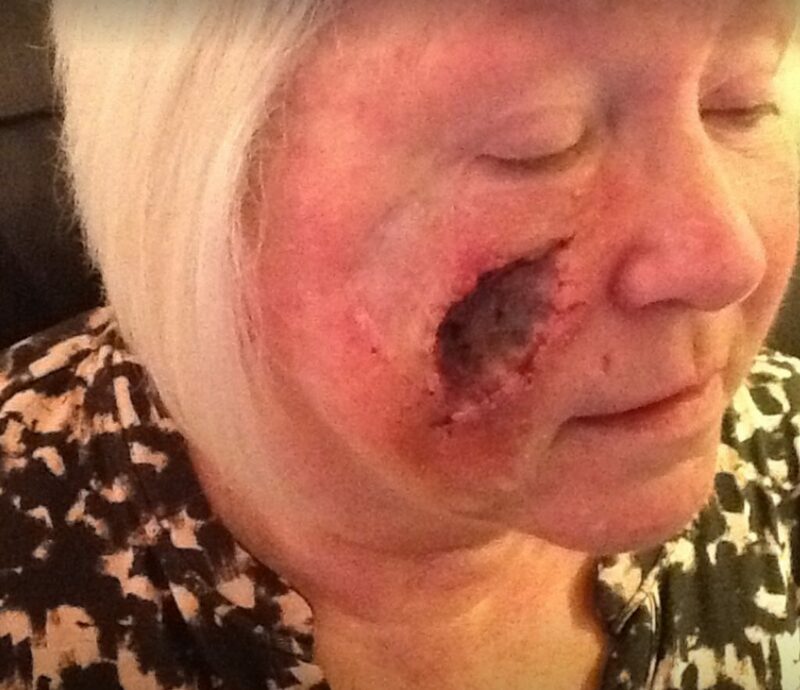 A former sunbed lover who used to deliberately get sunburn has revealed shocking pictures of how her battle with cancer left her with a giant HOLE in her face in a bid to warn others. 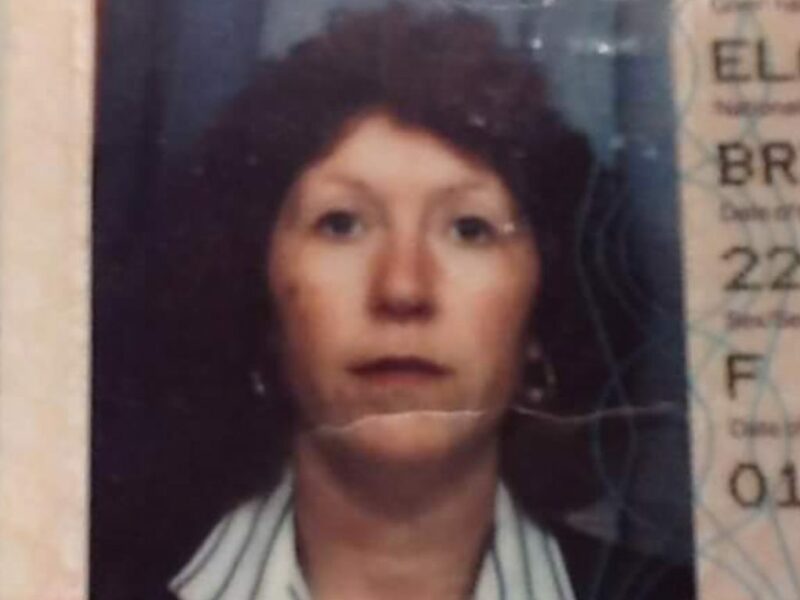 Elaine Sheaf has had 15 gruelling procedures since her facial tumours were diagnosed in 2013, which she believes could have been caused from sunbeds she used four decades ago. 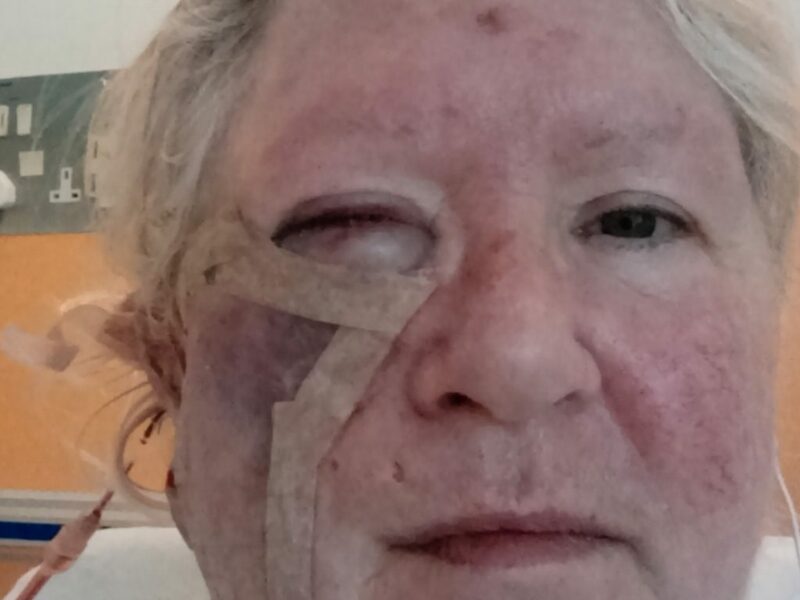 The 62-year-old, from Rochester, Kent, has also had skin grafts from behind her ears, thighs, shoulders and even eyelids in an attempt to reconstruct her face after the tumours were removed. Doctors had to repeatedly cut away bigger and bigger chunks of Elaine’s face as the malignant melanoma spread – even shaving away large portions of her cheek bone as the tumour went deeper. Despite the extreme operations, Elaine and her husband, Jeff, 64, were told that the stage four cancer had tragically spread to her lungs after two nodules were found by a PET scan. The couple are hoping the raw images of her treatment and the alarming impact the disease had upon her face will shock people into avoiding sunbeds, which they believe were one of the main factors behind her cancer. Elaine said: “I’ve always been quite fair-skinned but getting a bit burned was the aim back then. We used to laugh and say we looked like strawberries – it was so stupid. “Yet you can go anywhere and put on a cream and get the same result. “I beg people to take the proper precautions when on holiday and don’t go on sunbeds. “People need to know that going on them can be absolutely fatal. You need to look after yourself and your skin. “You really have got to be mad to go on them. Do it the safe way by using fake tan. In 1995, Elaine developed a small pea-sized mole on her cheek but says doctors claimed it was nothing to worry about. After bumping into an old friend she hadn’t seen for years in 2013, she pointed out the mole to Elaine claiming it had grown since they’d last seen each other. It was that moment that made Elaine realise the mole had grown over time, become irregular in shape and was approximately the size of a £2 coin. Visiting the doctor about the mole for the second time in almost 20 years, Elaine was then referred to a dermatologist who soon confirmed it was skin cancer. and ultimately, the realisation that it has spread to her lungs. 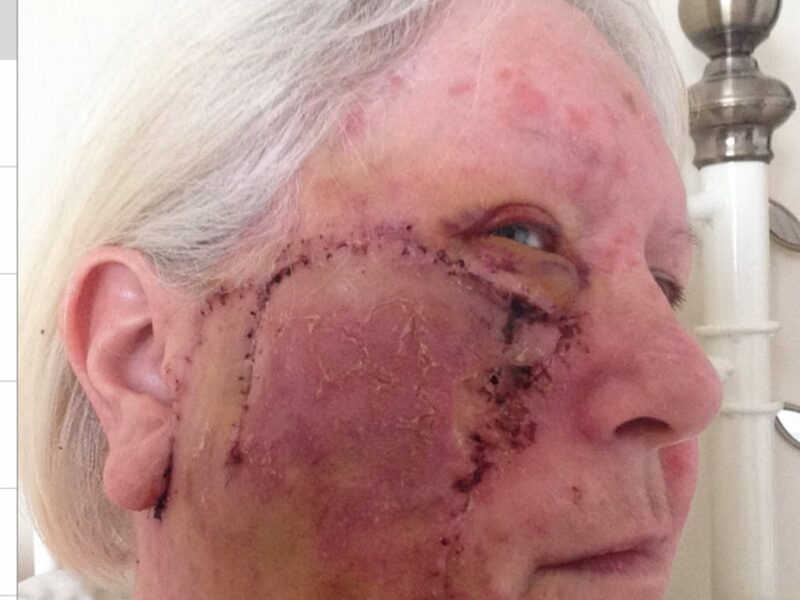 Elaine said: “I know it’s very hard for people to take on board when they’re not aware of what the skin cancer can do. “When I watch friends and see people with moles, I really don’t stop nagging them now to get them checked. You really have to be careful – I wish I’d known. “I actually had a biopsy on this particular mole in 1995 and they said it was nothing to worry about. has grown’ and I realised it had. “Shortly after, I noticed a sore on it and thought I will go to the doctors again to get it checked. “From 1995 to 2013 it had grown from a small domino dot-sized to around an inch. “I didn’t really notice it had changed because I saw it every day, but it was only when someone else noticed it that it hit me that it’d changed quite a bit. “In the end, it had gone from a circle – like a freckle – to a more jagged shape and that’s one of the signs too. “It was never painful, just a bit itchy. I’d rub it all the time but never thought anything of it until that friend pointed it out. “In 2015, I started radiotherapy for two years and had surgery too. I would come back from surgery, get back home and think it was getting better, then all of a sudden I’d notice a little black speckle at the bottom and ring the hospital back. “Then they’d say ‘no, that needs to come off immediately’ and I’d have to go back. They’d have to cut really deep and shave some of my cheek bone away. “In May this year, I had to have surgery on my forehead which they didn’t think was linked but it had the same chance of changing. The ex-bank cashier was left was a gaping hole in her face following her treatment and claims it has left her scared to leave the house. Despite being given special make-up from a department in the hospital, Elaine feels that her scarring is too extreme for it to work and due to the loss of cheek bone her face is indented. In October [Wednesday 18], she had to go through one of the hardest parts of her treatment, a lung biopsy, which was carried out while she was still awake. It followed a CT scan that revealed two nodules on her lungs. Vowing to never go through the procedure again, Elaine and Jeff went to the hospital for her results to find out the biopsy had been unsuccessful. She has now been offered a course of immunotherapy despite this. Elaine said: “I had to have a huge needle through my chest and into my lungs while I was awake, under local anaesthetic. If they said to me tomorrow ‘you are going to have to do that again’ I’d say no way. “When you’re having surgery what you don’t hear or see doesn’t matter but when you’re awake, it’s horrendous. I could feel the needles as it went in and out of my chest around 20 times and it gave me a panic attack. “Part of my lip is numb so when I’m talking my lip doesn’t really move. It’s stopped me going out. “I went to a place in the hospital which is for people who have disfigurement due to burns or surgery and they gave me special make-up and taught me how to put it on but that was years ago. Now, even with make up on, if I turn sideways my face is indented because my cheek has been cut away. “I would say to anyone, if you are worried about a mole or something on your skin, don’t let [doctors] tell you that it’s fine because if I had done that I wouldn’t be here now. Jeff, has supported his wife throughout her treatment and claims people in the street are often shocked by her scars. Jeff, a driver for a defence company, admits that the couple’s friends used to have sunbeds in their homes and one opened a sunbed shop being totally oblivious to the danger of them. In her 20s, Jeff claims Elaine and her friends could go on sunbeds for an hour at a time, come off for a drink and get back on them again. Now he has spoken of his heartbreak at seeing his wife suffer and, despite being cautious to categorically say sunbeds caused the cancer, is urging youngsters to stay well clear of the machines. Jeff said: “These moles can just turn at any time and the cancer can spread very quickly. It’s a monster. “My god, has she been through it. The photographs are horrendous. “In those days they would go on the sunbeds for an hour at a time. Sometimes they’d go on them, say ‘I’m hot I’m getting a drink’ then get back on them. “I can’t come out and say ‘of course it was sunbeds’ but skin cancer is primarily caused by sun damage. “I think the original cause was when she was using them. She’d go on them about three times a week and in those days people who opened up sunbed shops didn’t have a clue. My friend had one in her house. “Our friend’s daughter said to us a few months ago ‘I’ve got a mole and it’s itchy’. Elaine took her to the doctors for them to have a look at it and it was similar to Elaine’s when it first started. “It sounds awful but some people will say they have skin cancer on their legs and it’s a little bit and they get it cut out, but Elaine has it on her face. “I think ‘Jesus Christ why does she have it there’. My wife’s face is horrendous. “I honestly think the sunbed kickstarted it but I can’t be 100 per cent certain because it’s hard for the consultants to categorically say one thing was the cause. She hadn’t used the sunbeds since she was in her 20s. “We were sitting in a café a few weeks ago and a man came up to us and said ‘have you been hitting her?’ I just said to him ‘you haven’t got a clue’. “It’s the worst place to have something like this for a woman – right on her face. According to the British Skin Foundation, people who are at the most risk of developing malignant melanoma are fair-skinned people who burn easily, have past episodes of sunburn, have more than 50 moles and have already had, or have family who have had, skin cancer. It states that ‘the most important preventable cause is exposure to too much ultraviolet light in sunlight’, which can be from the natural sun or sunbeds. While the charity states three-quarters of those who have a melanoma removed will have no further problems, it is key to catch the cancer early. In Elaine’s case, she hadn’t had the mole checked in almost 20 years so there is no determining when the skin became cancerous.